Gallium(III) 5,10,15-(tris)pentafluorophenylcorrole and its freebase analogue exhibit low micromolar cell cytotoxicity. This manuscript describes an RNA transcription reaction, imaging RNA with an ethidium bromide-stained gel, and quantifying RNA with UV-Vis spectroscopy, in order to assess transcription inhibition by corroles and demonstrates a straightforward method of evaluating anticancer candidate properties. Tang, G. Y., Pribisko, M. A., Henning, R. K., Lim, P., Termini, J., Gray, H. B., Grubbs, R. H. An In Vitro Enzymatic Assay to Measure Transcription Inhibition by Gallium(III) and H3 5,10,15-tris(pentafluorophenyl)corroles. J. Vis. Exp. (97), e52355, doi:10.3791/52355 (2015). Chemotherapy often involves broad-spectrum cytotoxic agents with many side effects and limited targeting. Corroles are a class of tetrapyrrolic macrocycles that exhibit differential cytostatic and cytotoxic properties in specific cell lines, depending on the identities of the chelated metal and functional groups. The unique behavior of functionalized corroles towards specific cell lines introduces the possibility of targeted chemotherapy. Many anticancer drugs are evaluated by their ability to inhibit RNA transcription. Here we present a step-by-step protocol for RNA transcription in the presence of known and potential inhibitors. The evaluation of the RNA products of the transcription reaction by gel electrophoresis and UV-Vis spectroscopy provides information on inhibitive properties of potential anticancer drug candidates and, with modifications to the assay, more about their mechanism of action. Little is known about the molecular mechanism of action of corrole cytotoxicity. In this experiment, we consider two corrole compounds: gallium(III) 5,10,15-(tris)pentafluorophenylcorrole (Ga(tpfc)) and freebase analogue 5,10,15-(tris)pentafluorophenylcorrole (tpfc). An RNA transcription assay was used to examine the inhibitive properties of the corroles. Five transcription reactions were prepared: DNA treated with Actinomycin D, triptolide, Ga(tpfc), tpfc at a [complex]:[template DNA base] ratio of 0.01, respectively, and an untreated control. The transcription reactions were analyzed after 4 hr using agarose gel electrophoresis and UV-Vis spectroscopy. There is clear inhibition by Ga(tpfc), Actinomycin D, and triptolide. This RNA transcription assay can be modified to provide more mechanistic detail by varying the concentrations of the anticancer complex, DNA, or polymerase enzyme, or by incubating the DNA or polymerase with the complexes prior to RNA transcription; these modifications would differentiate between an inhibition mechanism involving the DNA or the enzyme. Adding the complex after RNA transcription can be used to test whether the complexes degrade or hydrolyze the RNA. This assay can also be used to study additional anticancer candidates. Initial cell-based assays indicate that these compounds show promise as anti-cancer therapeutic agents, which merits further investigation into the mechanism of action. Transcription inhibition is observed with certain organometallic complexes17-27 and we sought to examine this process as a possible mechanism for the cytotoxic behavior of the corrole family. This transcription assay provides a straightforward, inexpensive, and facile method for assessing transcription inhibition, which will lead to more detailed information about the effects of these molecules in live cells. NOTE: When working with RNA maintain a clean working environment to avoid contamination by DNase and RNase enzymes that degrade DNA and RNA. Ensure that pipette tips and tubes are DNase and RNase free. It is also helpful to wipe down lab surfaces and equipment such as pipettes, tube holders, etc. with a decontamination solution. Prepare the corrole and inhibitor compounds in a 0.01:1 molar ratio of [complex]:[DNA]. NOTE: In our case, the ratio was 4.3 fmol complex: 0.43 pmol DNA, where the DNA template used was apET-28c vector with ligA gene from E. coli under control of the T7 promoter. Other DNA with the T7 promoter are also valid candidates for running the transcription assay. Dissolve Actinomycin D, triptolide, tpfc, and Ga(tpfc) in dimethyl sulfoxide (DMSO) in clean, separate containers. Obtain the final concentration of a 0.01:1 molar ratio of [complex]:[DNA] by using serial dilutions with nuclease-free water. Dissolve 1 mg Actinomycin D in 1.8 ml DMSO. Aliquot 10 µl to a separate container and dilute to 1 ml with nuclease-free water to create a 1/100 dilution. Aliquot 1 µl of the dilution to a separate container and dilute to 1 ml with nuclease-free water to create a 1/1,000 dilution. NOTE: The concentration of the final solution of Actinomycin D is 4.3 fmol. Dissolve 1 mg triptolide in 0.64 ml DMSO. Aliquot 1 µl to a separate container and dilute to 1 ml with nuclease-free water to create a 1/1,000 dilution. Aliquot 1 µl of the dilution to a separate container and dilute to 1 ml with nuclease-free water to create a second 1/1,000 dilution. NOTE: The concentration of the final solution of triptolide is 4.3 fmol. Dissolve 1 mg tpfc in 2.9 ml DMSO. Aliquot 10 µl to a separate container and dilute to 1 ml with nuclease-free water to create a 1/100 dilution. Aliquot 1 µl of the dilution to a separate container and dilute to 1 ml with nuclease-free water to create a 1/1,000 dilution. NOTE: The concentration of the final solution of tpfc is 4.3 fmol. Dissolve 1 mg Ga(tpfc) in 2.6 ml DMSO. Aliquot 10 µl to a separate container and dilute to 1 ml with nuclease-free water to create a 1/100 dilution. Aliquot 1 µl of the dilution to a separate container and dilute to 1 ml with nuclease-free water to create a 1/1,000 dilution. NOTE: The concentration of the final solution of Ga(tpfc) is 4.3 fmol. NOTE: These corroles and inhibitors are not soluble in water and must be pre-dissolved in DMSO. Small amounts of DMSO (below 1%) do not induce cytotoxicity in the cells (unpublished data). Prior to beginning the transcription reaction, prepare the necessary reagents individually or purchase them from a commercial vendor. Thaw on ice all frozen reagents (refer to Table 1 for a list of frozen reagents). Allow the 10x Reaction Buffer and the 4 ribonucleotide (ATP, CTP, GTP, and UTP) solutions time to mix until they are completely dissolved in solution. Briefly centrifuge all reagents to prevent loss of material on the rim of the tube. Once thawed, store ribonucleotides on ice while keeping the 10x Reaction Buffer at RT. Combine reagents for transcription reaction at RT (refer to Table 2 for a list of reagents). NOTE: The spermidine in the 10x Reaction Buffer can coprecipitate the template DNA if the reaction is assembled on ice rather than at RT. Mix thoroughly by flicking the tube or pipetting the mixture up and down gently. After mixing, centrifuge briefly to collect reaction mixture at the bottom of the tube. Incubate the reaction mixture at 37 °C for a total of 2-4 hr. NOTE: The necessary reaction times will vary with DNA template size and sequence. This step may require optimization for specific sequences. Shorter templates may require longer reaction times for a high yield of total RNA. Remove 4 µl aliquots from each reaction after each hour and store at -20 °C. Modify as needed for desired timepoints. Following the transcription reaction, purify the RNA using microcentrifuge-compatible chromatography columns. NOTE: Column chromatography is a common and convenient method to purify RNA. Other purification methods also exist such as Lithium Chloride precipitation, phenol:chloroform extraction, isopropanol precipitation, as well as other commercially available kits. Evenly resuspend the Sephadex matrix in the column buffer by vigorously inverting the column three or more times. Do this by flicking the column sharply. Remove the top cap from the column. There will be some residual Sephadex matrix in the cap; if the cap is filled with the matrix, replace the cap onto the column and repeat the previous step until the majority of the matrix is in the column. Snap off the bottom tip of the column. NOTE: Some liquid may escape from the column. Place column in a sterile (RNase and DNase free) 1.5 ml microcentrifuge tube. Centrifuge the tube in a tabletop centrifuge at 1,000 x g for 1 min. Discard the 1.5 ml microcentrifuge tube with eluted buffer from the column. Immediately place the column in a new sterile 1.5 ml microcentrifuge tube and pipette the sample to the center of the column bed. Use 20-50 µl of sample to avoid overloading the column. NOTE: The eluent is the purified RNA sample. NOTE: Ethidium bromide fluoresces upon binding to DNA and RNA, therefore these biomolecules can be visualized with UV light by incubating them with 0.5 µg/ml ethidium bromide solution. Prepare a 1,000x stock solution of ethidium bromide (0.5 mg/ml) by dissolving 5 mg ethidium bromide in 10 ml of water. Prepare Tris Acetate EDTA (TAE) running buffer for gel electrophoresis. To make a 50x TAE buffer combine 2.0 M Tris-acetate with 0.05 M Ethylenediaminetetraacetic acid (EDTA) and adjust the pH to 8.5. Prepare a 1% (weight/volume) agarose gel by dissolving 10 g UltraPure Agarose in 1 L 1x TAE buffer and melting the agarose with a conventional microwave oven. Once it has cooled to 50 °C, add 1 ml of 1,000x ethidium bromide to the 1% agarose gel solution, mix by gently swirling or by inverting in a closed container, then pour the agarose solution into a gel-casting platform and allow the gel to solidify at RT. NOTE: Ethidium bromide is a mutagen and potential carcinogen. Wear gloves and handle solutions carefully. For proper handling procedures of ethidium bromide, please see: http://www.sciencelab.com/msds.php?msdsId=9927667. After the gel has solidified, place the set gel in the electrophoresis tank. Add enough TAE buffer to cover the gel until the wells are submerged. Check that the level of the TAE buffer is approximately 1 mm above the level of the gel. Remove the gel comb. NOTE: Removing the comb after wells are submerged prevents air pockets from being trapped in the wells. Prepare the RNA samples. Combine 1 µl of each purified sample aliquot with 1 µl Gel Loading Buffer (or with 1 µl 10x loading buffer and diluted to 10 µl with nuclease-free water) and mix thoroughly by pipetting up and down with a micropipette. Load the gel with each sample by carefully pipetting the solution into the bottom of each well. Take care not to leave any air bubbles or mix samples between wells. NOTE: A RNA ladder can also be used to determine the size of the transcript. Attach the leads so that the DNA will migrate into the gel towards the positive lead. Set the voltage to the desired level, typically 1 to 10 V/cm of gel. Run the gel for however long is sufficient for significant separation between the RNA fragments, using the migration of dyes to monitor the progress of the separation. NOTE: A 23 cm x 25 cm gel at 250 V will take approximately 1 hr, while an 8 cm x 8 cm gel at 150 V will take approximately 20 min. Smaller RNA fragments have better resolution when run at higher voltages. Turn off the power supply when the dye from the loading buffer has migrated a distance judged sufficient for separation between the RNA fragments. Image the RNA under UV light as the ethidium bromide will fluoresce. Take a picture of the image and compare fluorescence intensities of the purified RNA from each condition. Place 2 µl H2O on a NanoDrop 2000, or similar machine, and measure the Blank. Next, place 2 µl of each RNA sample, following purification, on the spectrophotometer and measure UV-Vis from a wavelength range of 200 nm to 800 nm. In the case that absorbance is above 1 O.D., dilute the samples in nuclease‐free water to obtain an O.D. less than 1. Use graphing software to plot the various samples and compare O.D. at 260 nm. Agarose gel electrophoresis is used to image the transcribed RNA. Ethidium bromide fluoresces upon binding (λem = 605 nm, λex = 210 nm, 285 nm)46 allowing imaging of RNA. Darker bands in the gel correspond to higher concentrations of RNA. If Actinomycin D, triptolide, or either corrole complex inhibits RNA transcription, the production of RNA is reduced and the band will appear lighter. Using this concept, relative inhibition can be assessed. Figure 3 shows the ethidium bromide stained agarose gel (1%) of RNA transcription reactions pre-treated with no complex, Actinomycin D, triptolide, tpfc, or Ga(tpfc) at a [complex]:[template DNA base] ratio of 0.01:1. Actinomycin D and triptolide show a clear decrease of RNA compared to that of the control, as expected of these long-studied inhibitors. The Ga(tpfc) band also has a very low level of RNA, while the tpfc band shows little to no inhibition and exhibits the same relative intensity as the control. UV-Vis measurements were taken for each sample after undergoing RNA transcription for 4 hr and purified with RNA spin column chromatography. The spectra of wavelengths 220 nm to 350 nm are shown in Figure 4, with the λmax occurring at 260 nm, corresponding to RNA absorption, and an extinction coefficient of 0.025 (μg/ml)-1 cm-1. The absorbance at 260 nm and 280 nm are reported in Table 3. An A260 reading of 1.0 is equivalent to about 40 µg/ml of RNA, and pure RNA has an A260/A280 ratio of 2.1, allowing for quantitative calculations of RNA produced during the transcription reaction and an assessment of the purity of the RNA after using the RNA spin column.44 Three of the four inhibitor-treated transcription reactions yielded less RNA than the control, with Ga(tpfc)-treated DNA transcribing only 0.07 times as much RNA as the untreated DNA. tpfc-treated DNA showed no apparent inhibition. All samples have an A260/A280 ratio of approximately 2.2, indicating relatively pure samples. Purification by RNA spin columns removes short RNA strands 20 or fewer nucleotides long. Residual DNA or strands longer than 20 nucleotides may be present in what is considered the purified samples. These slight impurities would result in an A260/A280 ratio slightly greater than 2.1. Figure 1. Molecular structures of Gallium(III) 5,10,15-(tris)pentafluorophenylcorrole (Ga(tpfc)) and the freebase analogue 5,10,15-(tris)pentafluorophenylcorrole (tpfc). Please click here to view a larger version of this figure. Figure 2. Cytotoxicity curves and GI50 values of corroles in prostate (DU-145) (gray), breast (MDA-MB-231) (blue), skin (SK-MEL-28) (orange), and ovarian (OVCAR-3) (green) cancer cell lines. Cells were incubated with (A) Ga(tpfc) and (B) tpfc, followed by determination of viability using the MTS-based colorimetric cell viability assay according to the manufacturer’s protocol. Please click here to view a larger version of this figure. Figure 3. Ethidium bromide stained agarose gel (1%) of transcription reactions after 4 hr of incubation. Lane 1 is a 1,000 bp DNA ladder as a standard. Lanes 2-6 show the RNA transcribed from 0.43 pmol DNA and treated with 4.3 fmol of each inhibitor (a [complex]:[template DNA base] ratio of 0.01): the control (lane 2), Actinomycin D (lane 3), triptolide (lane 4), tpfc (lane 5), and Ga(tpfc) (lane 6). Figure 4. 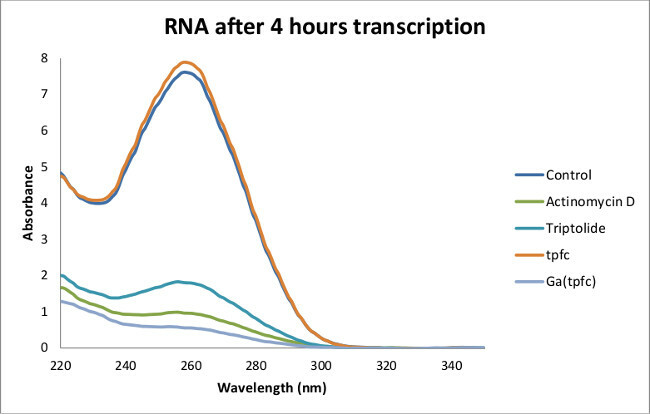 UV-Vis spectrum of 1:200 dilution of transcribed RNA at after 4 hr of incubation. The DNA template for the transcription reaction was treated with no complex, or with Actinomycin D, triptolide, tpfc, or Ga(tpfc) at a [complex]:[template DNA base] ratio of 0.01:1. The RNA concentration is measured by O.D. at 260 nm. Table 1. List of frozen reagents. Table 2. List of reagents for transcription reaction. This assay demonstrates that the addition of Ga(tpfc) inhibits RNA transcription comparably to the known DNA-binding anticancer complexes Actinomycin D and triptolide. The cytotoxic behavior of Ga(tpfc) (GI50 = 58.1-154.7 μM) may due to its inhibitive properties. Since no transcription inhibition was observed in tpfc, the cytotoxicity of tpfc is not due to RNA transcription inhibition but is caused by other means not yet studied. In the four transcription reactions performed, DNA was treated with Actinomycin D, triptolide, tpfc, or Ga(tpfc), at a [complex]:[template DNA base] ratio of 0.01, respectively, or an untreated control. The transcription reaction reagents were combined and the transcription reaction was allowed to proceed for 4 hr at 37 °C. The transcribed RNA was purified through a RNA spin column and the yield analyzed by UV-Vis and gel electrophoresis. The nature of transcription inhibition can be further investigated using this same technique with various modifications, or the compounds can be subjected to alternative in vitro and in vivo studies. Additional experiments which may help determine the molecular nature of the inhibition include X-ray crystallography of possible corrole-DNA adducts or computational modeling of the transcription reaction. The objective of this experiment was to determine whether the compounds inhibit transcription in order to collect information on their potential anticancer properties. That objective was achieved: tpfc exhibited no inhibition, while Ga(tpfc) exhibited clear inhibition and merits further study. The RNA transcription assay can be modified to provide more mechanistic detail. Addition of the anticancer agents (e.g., the corrole complexes) after the transcription reaction is complete can show whether the complexes degrade or hydrolyze the RNA. Another recommended experiment is to conduct the transcription reaction with all components with the exception of the RNA polymerase enzyme 10-fold lower to allow for differentiation between an inhibition mechanism involving the DNA or the enzyme. Finally, incubation of the DNA or the polymerase with the complexes prior to RNA transcription would allow for increased binding between the complex and the respective target, ascertaining whether the complex inhibitive qualities are involved in DNA or polymerase binding, respectively. We sincerely thank Dr. Cindy N. Chiu for help with gel electrophoresis, and Andy Zhou and Michael Grodick for their generous donation of DNA and restriction enzyme. We gratefully acknowledge Professor J. Heath and Professor D. Prober for generous access to equipment and materials. We thank Dr. Karn Sorasaenee for helpful suggestions. We thank Mary H. Tang for creating the illustration used in the schematic overview in the video. Funding was provided by Johnson & Johnson and USC Y86786. American Cancer Society. American Cancer Society. Atlanta. Available from: http://www.cancer.org (2014). Weinstein, I. B. Addiction to oncogenes—The Achilles heel of cancer. Science. 297, 63-64 (2002). Derheimer, F. A., Chang, C. W., Ljungman, M. Transcription inhibition: A potential strategy for cancer therapeutics. Eur. J. Cancer. 41, (16), 2569-2576 (2005). Koumenis, C., Giaccia, A. Transformed cells require continuous activity of RNA polymerase II to resist oncogene-induced apoptosis. Mol. Cell. Biol. 17, (12), 7306-7316 (1997). Stellrecht, C. M., Chen, L. S. Transcription Inhibition as a Therapeutic Target for Cancer. Cancers. 3, (4), 4170-4190 (2011). Bensaude, O. Inhibiting eukaryotic transcription: Which compound to choose? How to evaluate its activity. Transcription. 2, (3), 103-108 (2011). Liu, Q. Triptolide and its expanding multiple pharmacological functions. International Immunopharmacology. 11, (3), 377-383 (2011). Mahammed, A., Gray, H. B., Weaver, J. J., Sorasaenee, K., Gross, Z. Amphiphilic corroles bind tightly to human serum albumin. Bioconjugate Chemistry. 15, (4), 738-746 (2004). Lim, P. Differential cytostatic and cytotoxic action of metallocorroles against human cancer cells: Potential platforms for anticancer drug development. Chemical Research in Toxicology. 25, (2), 400-409 (2012). Bendix, J., Dmochowski, I. J., Gray, H. B., Mahammed, A., Simkhovich, L., Gross, Z. Structural, electrochemical, and photophysical properties of gallium(III) 5,10,15-tris(pentafluorophenyl)corrole. Angewandte Chemie-International Edition. 39, (22), 4048-4051 (2000). Hwang, J. Y., Gross, Z., Gray, H. B., Medina-Kauwe, L. K., Farkas, D. L. Ratiometric spectral imaging for fast tumor detection and chemotherapy monitoring in vivo. Journal of Biomedical Optics. 16, (6), 1-6 (2011). Agadjanian, H. Tumor detection and elimination by a targeted gallium corrole. Proceedings of the National Academy of Sciences of the United States of America. 106, (15), 6105-6110 (2009). Hwang, J. Y. Photoexcitation of tumor-targeted corroles induces singlet oxygen-mediated augmentation of cytotoxicity. Journal of Controlled Release. 163, (3), 368-373 (2012). Hwang, J. Y., et al. Investigating photoexcitation-induced mitochondrial damage by chemotherapeutic corroles using multimode optical imaging. Journal of Biomedical Optics. 17, (1), 11 (2012). Hwang, J. Y. 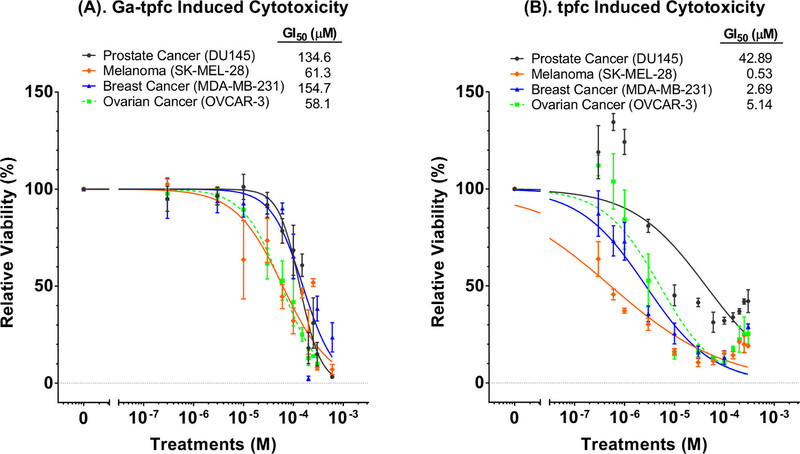 A Mechanistic Study of Tumor-Targeted Corrole Toxicity. Molecular Pharmaceutics. 8, (6), 2233-2243 (2011). Saltsman, I., Mahammed, A., Goldberg, I., Tkachenko, E., Botoshansky, M., Gross, Z. Selective substitution of corroles: Nitration, hydroformylation, and chlorosulfonation. Journal of the American Chemical Society. 124, (25), 7411-7420 (2002). Gershman, Z., Goldberg, I., Gross, Z. DNA Binding and Catalytic Properties of Positively Charged Corroles. Angewandte Chemie. 46, (23), 4320-4324 (2007). Fu, P. K., Bradley, P. M., Turro, C. Stabilization of duplex DNA structure and suppression of transcription in vitro by bis(quinone diimine) complexes of rhodium(III) and ruthenium(II). Inorganic Chemistry. 42, (3), 878-884 (2003). Sorasaenee, K., Fu, P. K. -L., Angeles-Boza, A. M., Dunbar, K. R., Turro, C. Inhibition of Transcription in Vitro by Anticancer Active Dirhodium(II) Complexes. Inorg. Chem. 42, (4), 1267-1271 (2003). Aguirre, J. D., Lutterman, D. A., Angeles-Boza, A. M., Dunbar, K. R., Turro, C. Effect of axial coordination on the electronic structure and biological activity of dirhodium(II,II) complexes. Inorganic Chemistry. 46, (18), 7494-7502 (2007). Raja, N. S., Nair, B. U. Chromium(III) complexes inhibit transcription factors binding to DNA and associated gene expression. Toxicology. 251, (1-3), 61-65 (2008). Gao, F., Chen, X., Wang, J. Q., Chen, Y., Chao, H., Ji, L. N. In Vitro Transcription Inhibition by Ruthenium(II) Polypyridyl Complexes with Electropositive Ancillary Ligands. Inorganic Chemistry. 48, (13), 5599-5601 (2009). Chen, X., Gao, F., Zhou, Z. X., Yang, W. Y., Guo, L. T., Ji, L. N. Effect of ancillary ligands on the topoisomerases II and transcription inhibition activity of polypyridyl ruthenium(II) complexes. Journal of Inorganic Biochemistry. 104, (5), 576-582 (2010). Chen, X., Gao, F., Yang, W. Y., Sun, J., Zhou, Z. X., Ji, L. N. Effects of intercalative ligands on the DNA binding, DNA topoisomerase II and DNA transcription inhibition of polypyridyl ruthenium(II) complexes. Inorganica Chimica Acta. 378, (1), 140-147 (2011). Chen, X., Gao, F., Yang, W. Y., Zhou, Z. X., Lin, J. Q., Ji, L. N. Structure-activity relationship of polypyridyl ruthenium(II) complexes as DNA intercalators, DNA photocleavage reagents, and DNA topoisomerase and RNA polymerase inhibitors. Chemistry & Biodiveristy. 10, (3), 367-384 (2013). Chifotides, H. T., Fu, P. K., Dunbar, K. R., Turro, C. Effect of equatorial ligands of dirhodium(II,II) complexes on the efficiency and mechanism of transcription inhibition in vitro. Inorganic Chemistry. 43, (3), 1175-1183 (2004). Pauly, M., Kayser, I., Schmitz, M., Dicato, M., Del Guerzo, A., Kolber, I., Moucheron, C., Kirsch-De Mesmaeker, A. In vitro inhibition of gene transcription by novel photo-activated polyazaaromatic ruthenium(II) complexes. Chemical Communications. 10, 1086-1087 (2002). Richardson, D. R. Iron and gallium increase iron uptake from transferring by human melanoma cells: Further examination of the ferric ammonium citrate-activated iron uptake process. Biochimica et Biophysica Acta. 1536, (1), 43-54 (2001). Collery, P., Keppler, B., Madoulet, C., Desoize, B. Gallium in cancer treatment. Critical Reviews in Oncology / Hematology. 42, (3), 283-296 (2002). Hedley, D. W., Tripp, E. H., Slowiaczek, P., Mann, G. J. Effect of gallium on DNA synthesis by human T-cell lymphoblasts. Cancer Research. 48, (11), 3014-3018 (1988). Chitambar, C. R., Narasimhan, J., Guy, J., Sem, D. S., O’Brien, W. J. Inhibition of ribonucleotide reductase by gallium in murine leukemic L1210 cells. Cancer Research. 51, 6199-6201 (1991). Seidman, A. D. Continuous infusion gallium nitrate for patients with advanced refractory urothelial tract tumors. Cancer. 68, 2561-2565 (1991). Chitambar, C. R. Medical applications and toxicities of gallium compounds. International Journal of Environmental Research and Public Health. 7, (5), 2337-2361 (2010). Chitambar, C. R. Gallium-containing anticancer compounds. Future Medicinal Chemistry. 4, (10), 1257-1272 (2012). Trask, D. K., Muller, M. T. Stabilization of type I topoisomerase-DNA covalent complexes by actinomycin D. Proceedings of the National Academy of Sciences of the United States of America. 85, (5), 1417-1421 (1988). Chang, T. C., Tsai, L. C., Hung, M. W., Chu, L. L., Chu, J. T., Chen, Y. C. Effects of transcription and translation inhibitors on a human gastric carcinoma cell line. Potential role of Bcl-X(S) in apoptosis triggered by these inhibitors. Biochemical Pharmacology. 53, (7), 969-977 (1997). Mischo, H. E., Hemmerich, P., Grosse, F., Zhang, S. Actinomycin D induces histone gamma-H2AX foci and complex formation of gamma-H2AX with Ku70 and nuclear DNA helicase II. The Journal of Biological Chemistry. 280, (10), 9586-9594 (2005). Titov, D. V. XPB, a subunit of TFIIH, is a target of the natural product triptolide. Nature Chemical Biology. 7, (3), 182-188 (2011). Leuenroth, S. J., Crews, C. M. Triptolide-induced transcriptional arrest is associated with changes in nuclear substructure. Cancer Researcg. 68, (13), 5257-5266 (2008). Vispé, S. Triptolide is an inhibitor of RNA polymerase I and II-dependent transcription leading predominantly to down-regulation of short-lived mRNA. Molecular Cancer Therapeutics. 8, (10), 2780-2790 (2009). MEGAscript T7 Transcription Kit User Guide. Current Protocols in Molecular Biology. Life Technologies. Carlsbad. Available from: http://tools.lifetechnologies.com/content/sfs/manuals/1330M_G.pdf (2014). Fleige, S., Pfaffl, M. W. RNA integrity and the effect on the real-time qRT-PCR performance. Molecular Aspects of Medicine. 27, (2-3), 126-139 (2006). Quick Spin Columns Protocol. Roche Diagnostics GmbH. Mannheim. Available from: https://pim-eservices.roche.com/LifeScience/Document/95c2b1f8-7cf1-e311-98a1-00215a9b0ba8 (2013). RNA quality control. KU Leuven: Biomedical Genomics. Leuven. Available from: http://biomedicalgenomics.org/RNA_quality_control.html (2007). Sabris, R. W. Handbook of biological dyes and stains: synthesis and industrial application. Wiley. Hoboken, NJ. (2010).